A great way for the whole family to enjoy Winter and get some exercise in or near Glacier National Park is on snowshoes, requiring minimal skill and gear. Snowshoeing, for beginners or experts, is a great way to explore in and around Glacier National Park while getting some great exercise. A $7 State Land Use Permit fee may be required for snowshoeing in areas outside Glacier National Park. Nordic Centers request donations and/or offer fee-memberships for trail use and maintenance. While many roads are closed in the winter, snowshoeing enthusiasts of all ages and abilities can still access miles and miles of tracks and fresh powder in and around Glacier National Park, located in northwest Montana. GNP covers more than one million wilderness acres that grizzlies, moose, elk, and 63 varieties of mammals call home. Inside Glacier National Park, Going-to-the-Sun Road offers one of the most breathtaking, scenic snowshoe routes available. Short trails branch off from the road, complimenting snowshoeing sightseeing options. Apgar – West Glacier: About 10 miles roundtrip, Apgar Lookout is beautiful but challenging for beginners. St. Mary: Parking for trailheads offering 1 to 8-mile roundtrip trails is near the 1913 Ranger Station. North Fork: These ski routes start at the Polebridge Ranger Station and follow mostly unplowed gravel roads. Lake McDonald – Avalanche: This popular, easy terrain area can be found off Going-To-The-Sun Road. Two Medicine: Skiing starts 4 miles north of East Glacier near Two Medicine Road and Highway 49 junction with 6, 10, and 16-mile roundtrip options. Marias Pass: This popular, windy skiing area features Autumn Creek Trail, a 6-mile roundtrip route that starts easy near Essex and morphs into an advanced skier trail. Many of the areas listed above are not well-marked and share terrain with Cross Country Ski enthusiasts. Be sure to sign in at trailheads and confer with a ranger about weather conditions before heading out on a snowshoeing adventure. Pets must be leashed at all times in GNP and are not permitted on trails, unplowed areas, or backcountry. 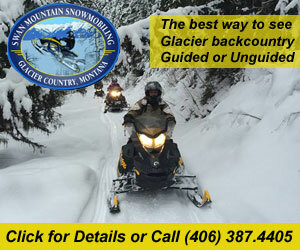 Snowmobiling is also prohibited in Glacier National Park. 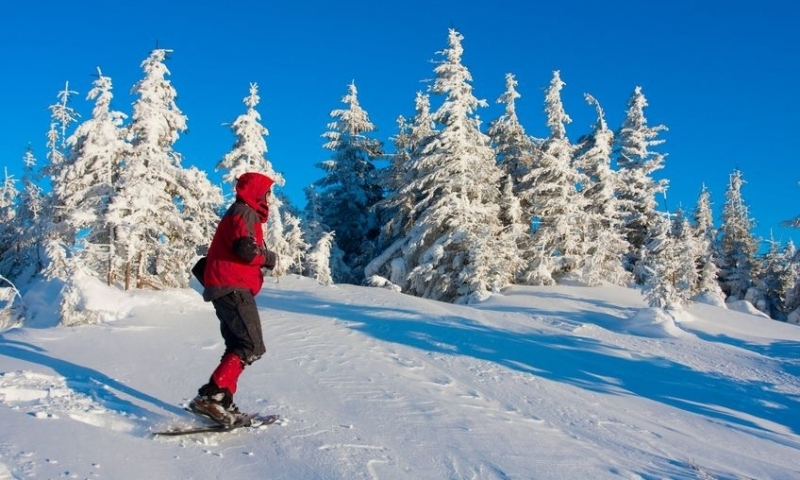 Snowshoeing is also popular at area Nordic centers including: Glacier Nordic Club, Bigfork Community Nordic, Big Mountain Nordic Center, and Stillwater Nordic Center. 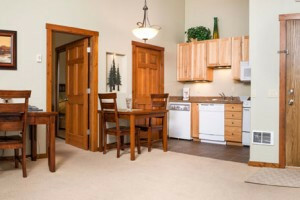 Discover the experienced local suppliers/outfitters/centers listed on this page in surrounding Glacier National Park communities that offer snowshoes, poles, and other winter survival gear for rental or purchase. A $7 State Land Use Permit may be required for areas outside Glacier National Park. For informative tours, snowshoeing is an easy way to explore in and around Glacier National Park, aided by an experienced local guide's knowledge of history, wildlife, geology, and biology of this unique region. Carry appropriate survival gear for rapidly changing alpine weather conditions. 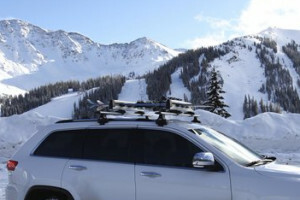 Take avalanche and backcountry survival classes before snowshoeing alone or in groups. 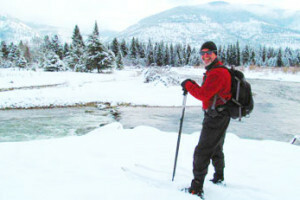 Those snowshoeing should stay in separate tracks from cross country skiers to maintain trail integrity for all users.